Our Unique Retriever solves the problem of staining formalin fixed tissues. This is an affordable solution to all known major problems with immunohistochemistry on paraffin sections. Ease of use combined with high reproducibility of the results will give you the best quality immunostaining. The Retriever is a bench-top model for thermally processing slides of formalin-fixed, paraffin embedded tissues prior to immunostaining. The model has been designed to ensure identical processing of all the samples during a processing cycle, as well as the identical processing of the samples in individual sessions. The retriever preserves processed tissues. Run antigen unmasking in 6 various buffers at once. Perform gentle antigen retrieval that does not damage the tissue morphology. Get identical results every time. Compare series of slides treated in independent sessions. How does the Retriever work? Ok, basically it is a pressure cooker. 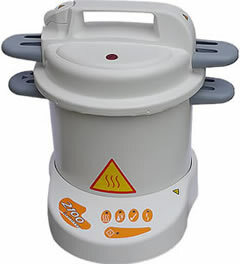 However, a pressure cooker specially designed to unmask the antigen on tissue sections. The core principle is heating of the chambers with the slides at high temperature (>120°C) and high pressure. Sensors control the heating profile for the temperature and pressure to be reached at certain pace and over certain time. We did a lot of tests to find the optimal settings. When the required temperature is reached, it will be kept for several minutes. After that the slides will be cooling over 2 hours. Specially designed thermal walls of the unit control the speed of cooling of the inner chamber and slides. Who would benefit from using our Retriever? Investigative Pathology, where the high quality of staining (a picture may be published!) is required. Deparaffinized sections on slides are placed into the Processing (Tissue Slide) Chambers. Retriever can accommodate simultaneously from 1 to 6 Chambers, which allows you to process a series of slides in up to 6 different antigen unmasking buffers within the same session. Fill the chambers with a buffer of your choice. Place the Chambers into the Rack. Fill the Retriever with 750 ml of deionized/distilled water. Place the Rack into Retriever. Close the lid by a simple twist. Push the Start button. The tissues will be processed automatically. In about two hours (depends on the load) you can open the lid and proceed immunostaining. Fuses- Located under the control module, fuses F1 OA, 32 x 6.3mm, ceramic sand filled, Mains plug top fuse (User replaceable), F1 3A to BS1362 UK ONLY. Rating- Models are rated continuously for intermittent use. Body- Deep drawn aluminium. Lid - Aluminium. Heater- Externally surface mounted mechanically fixed electric element. Temperature Cut Out- Thermal fuse. Pressure- Calibrated pressure release valve. Max. Single Fault Temperature- 133.3°C. Environment Conditions- indoor use - temperature 5°C to 40°C - altitude up to 2000m - maximum relative humidity 80% for temperatures up to 31°C decreasing linearly to 50% relative humidity at 40°C. - mains supply voltage fluctuations not to exceed +10% of the nominal voltage. Input Connections- Mains inlet socket 'hot' format conforming to IEC 302. Safety Shut Down- See 'Temperature Cut Out'. If you already know the buffer that can be used for Microwave treatments of sections in order to unmask you antigen of interest, the high chances are that the same buffer may be used in Retriever. To improve the morphology of tissue of the processed sections, use one of our supplied ready-to-use buffers by choosing them according to pH. G variants of the same buffers for a more gentle processing of the tissues. The fixative used and the degree of fixation. Sections of formalin-fixed, paraffin embedded tissue of human sigmoid were deparaffinized and processed in Retriever to unmask the antigen. We used one cycle in R-Buffer C (pH 6.0) with cooling of the slides overnight. Antibody MIB-1 against proliferation marker Ki-67 (nuclear) was used together with R-Detect HRP detection system for immunostaining of sections. Sections of formalin-fixed, paraffin embedded tissue of human duodenum were deparaffinized and processed in Retriever to unmask the antigen. We used one cycle in R-Buffer C (pH 6.0) with cooling of the slides overnight. Antibody PC-10 against proliferation marker PCNA nuclear) was used together with R-Detect HRP detection system for immunostaining of sections. Sections of formalin-fixed, paraffin embedded tissue of human sigmoid were deparaffinized and processed in Retriever to unmask the antigen. We used one cycle in R-Buffer A (pH 8.1) with cooling of the slides overnight. Antibody #4B11 against T-cell marker CD8 (cell membrane) was used together with R-Detect HRP detection system for immunostaining of sections. Sections of formalin-fixed, paraffin embedded tissue of human cervix were deparaffinized and processed in Retriever to unmask the antigen. We used one cycle in R-Buffer C (pH 6.0) with cooling of the slides overnight. Antibody HECD-1 against cell adhesion molecule E-cadherin was used together with R-Detect HRP detection system for immunostaining of sections. The suggested protocol for processing tissues is optimized for routinely formalin-fixed and paraffin embedded material. If the tissue used for sections was insufficiently fixed, overfixed (was left in formalin for too long), or other fixative was used, the protocol may require some modifications. The easiest correction is to use EMS's own specially formulated buffers for a gentle (G) tissue processing. Use them instead of the basic buffers. For overfixed material try using U buffer or run the additional cycle in the same buffer. Choosing Buffer: Correction for the Nature of the Antigen and Epitope. Most of the nuclear antigens(apoptosis-related, survival-related, proliferation-related) R: Buffer A (or AG). The operation manual for the Retriever is online. Please click here. Publications: Real-world examples of the retriever in various types of research and clinical studies. Epitope recovery on formalin-fixed, paraffin embedded tissue sections, requires heat-induced treatment in buffer or, sometimes, proteolitic treatment of the deparaffinized tissue section. Which buffer to use, greatly depends on the exact antibody and the properties of the recognized epitope, therefore, one can find in literature and practice use of many buffers, including Citrate pH 3.4, Citrate 6.0, EDTA 8.0, Tris 9.0- 10.0, Tris-EDTA, etc. Moreover, for individual antigens also the time of recovery in the individual buffer should be defined, as this may be different, and the treatment often destroys the epitope. EMS offers a novel (patent-pending) technology for epitope recovery, primarily based on reversing the fixation effects of formaldehyde, which created links primarily between Îµ-amino groups of lysine and other amino-groups. The buffer was extensively tested in pathology Departments in United Kingdom, and has shown excellent results when used with different antibodies, including those that normally require for successful staining treatment only in Low, or only High pH buffers, or require protolithic treatment. The EMS Universal Buffer may be used in any heat-induced epitope recovery system (the time and temperature of treatment should be tested), but was specifically adjusted for tissue sections processing in our Antigen Retriever (62700 Series). Using our Universal Buffer in our Retriever guarantees the highest rate of success in recovering epitope for any antibody, especially one that was never previously used on formalin-fixed sections. R-Universal Buffer is supplied as 10x concentrate. For epitope recovery dilute 1 part of stock with 9 parts of deionized water. For epitope recovery dilute 1 part of stock with 9 parts of deionized water. The preparation is stable for 1 year when stored unopened at +4°C. Every lot is issued with a certificate indicating the expiry date. After opening, store at +4°C in the refrigerator and use within 6 months. Each lot is certified for compliance to specifications. The product is produced under DIN EN ISO 9001 :2008 Quality Management system for the products in Immunoassay Development and Measurement, Products for Bioanalytics and lmmunoassays. Immunosaver allows for Immunostaining with quick and easy activation of cell membranes and the nucleus. Immunosaver provides efficient antigen retrieval for successful immunostaining of a wide variety of antigens under optimized conditions. Protocols for both Light and Electron Microscopy may be found with this reagent. Retriever Tissue Slides are high adhesive glass microscope slides for paraffin-embedded tissue section, including tissue arrays. The slides were designed and optimized for the EMS Antigen Retriever (62700 series) to preserve the section attachment and tissue morphology during heat-induced epitope recovery in Retriever in pH6 (Low), pH9 (High), or Universal Retriever buffer. Slides can also be successfully used in any other epitope-recovery technology (autoclave, microwave, proteolitic) and show superior performance over positively charged or polylysine-coated slides, especially in high pH buffers and recovery buffers containing EDTA. Dimensions approximately 76 x 26mm, Thickness 1.0mm.